Tri-Cities employers added 1,000 nonfarm jobs in October, the unemployment was unchanged at 3.8%, and the average hourly wages for private-sector workers was up in both of the region’s two Metropolitan Statistical Areas. So far this year, nonfarm jobs have increased at an average of 200 per month and the jobs growth trend plateaued at 1% year-over-year growth in August. That’s the best trend growth since June 2016. October was the third straight month of monthly nonfarm job gains according to preliminary, unadjusted number from the Bureau of Labor Statistics Payroll Report. Although it was the weakest monthly report for new jobs since August, the total number of jobs was better than the pre-recession benchmark for the second time this year. Private sector job growth lagged the nonfarm sector. Private sector employers added 100 jobs. It was the weakest month-over-month report for that sector’s seven months of growth this year. So far this year it added new jobs at the rate of 170 per month. The BLS employment report shows employment in the seven-county region was 9,852 better than September and the labor force increased by 972 people. It was also the sixth month that the unemployment rate has been below 4%. Unlike the jobs report, neither employment nor the labor force is anywhere near pre-recession highs. In October there were 20,176 fewer people in the labor force, and 15,988 fewer area residents were employed. Much of the labor force participation decline can be attributed to the region’s rapidly aging population. Back-of-the-envelope calculations based on the most current Census population data show about 25 area residents turn 65 every day while 18 a day celebrate their 70th birthday. The three-county Johnson City Metropolitan Statistical Area (MSA) labor market added 1,000 nonfarm jobs in October, the unemployment rate dropped to 4% and the average weekly per hour wage increased 1.9% from September to $20.31. That was the best monthly pay increase since April. Johnson City has recovered from a six-month nonfarm job creation slump that began December last year. Currently, the labor market is growing at an average of 80 new nonfarm jobs a month. 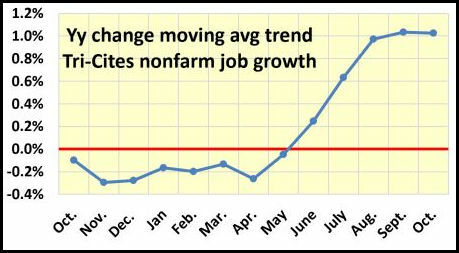 The private sector job growth rate is currently averaging 56 a month. Employment grew by 1,023 people in October, and the labor force was 987 more than it was in September. 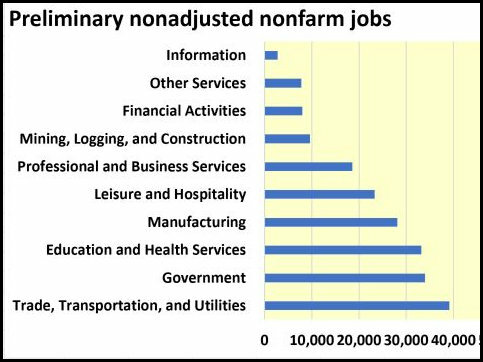 Sectors with the best year-over-year nonfarm job growth last month were: Trade, transportation and utilities; financial activities; professional and business services; leisure and hospitality; and government. Manufacturing was the only sector with a year-over-year job loss. October preliminary, unadjusted totals for nonfarm jobs in the seven-county Tri-Cities Consolidated Metropolitan Statistical District. The four-county Kingsport Bristol MSA’s nonfarm job level was unchanged from September and is at the highest level this year. So far this year, the labor market has added an average of 120 new jobs a month. October’s unemployment rate was 3.6%, and the average hourly private sector wage increased 0.5% to $18.32. The average hourly wage has seen seven month-over-month increases this year. Kingsport-Bristol’s private sector added 100 jobs in October, and the stood at its highest level this year. So far this year, the private sector has been adding jobs at the rate of 170 a month. Employment in Kingsport-Bristol increased by five in October, and the labor force was down by 15 workers from September level. Sectors with year-over-year job growth were other services; government; and trade, transportation, and utilities. Sectors with year-over-year job losses were: Mining, logging and construction; manufacturing; information; professional and business services; and leisure and hospitality.